The activities of the French Foreign Legion have long been the subject of considerable public interest, with novels such as 'Beau Geste' promoting a romantic and exciting image. Airfix made a number of sets based on popular 'adventures', both factual and fictional, so it was no surprise that the exploits of the Legion would be included. The popular image is of Legionnaires battling with Arabs dressed in their flowing robes, so this set of Bedouins was created. This is a mixed mounted and dismounted set, which tends to mean there are frustratingly few poses of each type. The four dismounted poses include two that are prone, and just one that is standing. This man is running with his arm in the air, and is not a pose we particularly like. In several of their earlier sets Airfix included poses of men waving their hands and/or weapons in the air, but this does not seem like a particularly common or natural pose to us. In addition the running Arab has a very small base and is very easily knocked over. Why Airfix (and others) chose to make the smallest base they thought they could get away with is a mystery, but it is an annoying feature of this figure. The mounted figures are the highlight of this set. Unlike the foot figures, all of whom wear the traditional Arab robes and shemagh headgear, the riders display a greater and more realistic variety of clothing. Half of them are unarmed and those that are seem content to brandish their weapons rather than use them. Having said that the poses are very nice and well sculpted. The two horses are the stock Airfix horse poses with the horse furniture changed. The camels were the first time these animals had been depicted in this scale, and have been superbly done. They have the saddle cloths richly decorated with woollen ornamentation in the Bedouin style, and look thoroughly authentic. However both the horses and camels have separate bases into which they fit via thin pegs under their hooves. The bases are very thin, so the pegs are very short as well as thin, and the resulting fit is extremely poor. 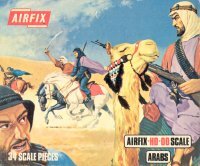 This has always been a major weakness of Airfix cavalry sets, and it makes these fine models much more difficult to use. At this stage in production Airfix were really starting to get the hang of good quality sculpting and moulds. Indeed this is arguably the finest sculpted set Airfix had produced up to that time, and compares well with today's high standards. There is virtually no flash, and so long as you can get the horses and camels to stay on their bases then this is a very pleasing set. While they were designed for raiding French North Africa, these figures could also serve in a number of other campaigns such as the Arab Revolt during the First World War. Whether they are suitable opponents for the Legion is another matter - some Berbers would have been much more useful, but perhaps beyond the understanding of the target customers of the day.